The kitchen is normally the most widely used room in the house and an ideal place to benefit from natural sunlight. A dining or breakfast area is a requirement in many modern kitchens, for informal meals, rushed weekday snacks, or lazy weekend brunches. An orangery extension to your kitchen can provide the additional space to do this. 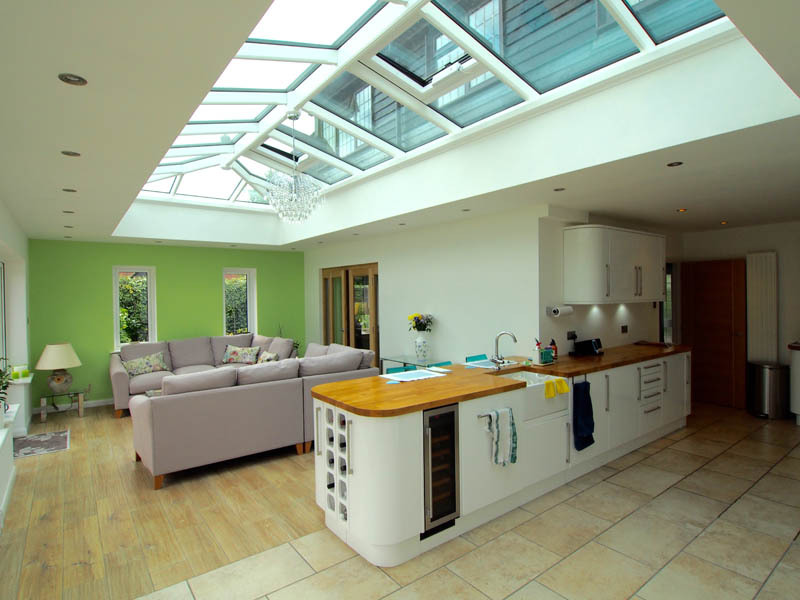 Allowing more light than a traditional extension, yet better insulation and heat-control than a conservatory, an orangery kitchen extension is the perfect solution. Each scenario is different, some clients will combine building the new space with re-modeling the entire space and fitting new kitchen units and appliances, others will not want to touch the existing equipment. Either way, the appliances need to remain functional during the build. We will always find a way of configuring the drainage, plumbing and electrics so this can be achieved. In most situations, the vast majority of the work can be done before touching the existing kitchen at all. Depending on the how the opening between new and old is to be created, we can generally get the new orangery watertight and secure before breaking into the main house. If a new kitchen is to be fitted, we can take care of the preparation work in advance. This might involve preparing drainage, plumbing and electrical points, plastering and tiling. We can coordinate this work so the project is done efficiently and cost-effectively.